The weight and space saving combined with improved performance has made fibre optics the main stay for a lot of our customer base. 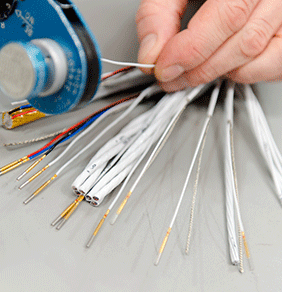 We support projects from large industrial installations to specialist high integrity applications. 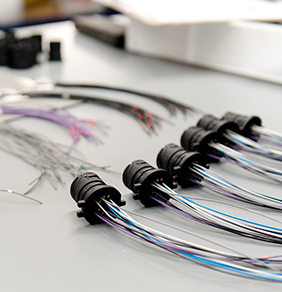 We help our customers with the design of their complete optical link systems, to incorporate fibre optics into their build process by blending with more traditional electrical cable assemblies. 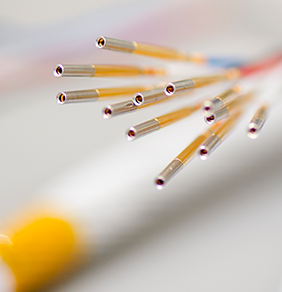 Some organisations see fibre optics as a black art but we see it as simple science and the application of engineering know-how. We work with our customers to fully understand the application and project then use our skills and knowledge to select the best components to deliver the right performance. But it is the skills of the operators that terminate the cables with constant repeatability that make us a long-term partner for a number of customers on fibre optic projects. This has led us to deliver systems that can go underwater, underground, on land, in vehicles, in the air or even in space. This service allow for customers to push the design envelope and gain advantages such as reducing cost, improving performance and achieving what was historically impossible. 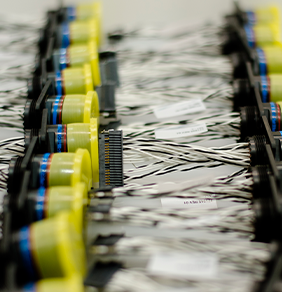 "...a fully integrated hybrid harness solution..."
Our in-house moulding and overmoulding facility provides the ability to reduce cost, reduce weight and reduce the component count all in one step.